In this summer, you can catch some sites of flamingos on the street. Really, there is a new tea cafe using the theme of flamingos opened up recently in Hong Kong. Flamingos are always a thing of fascination. After all, who can take their eyes off from those exotic pink feathers and their elegant posture ? 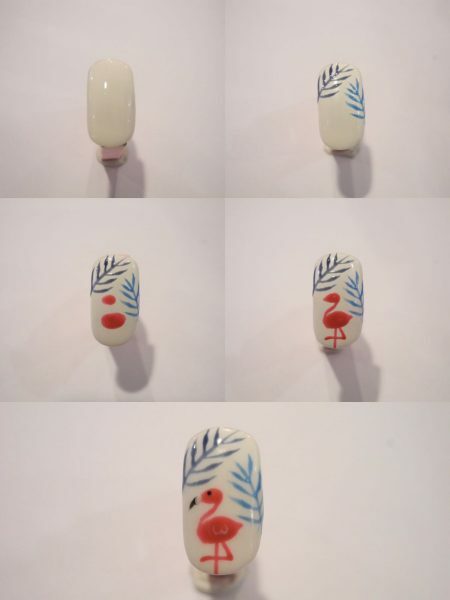 Let us show you how to make a gorgeous tropical flamingo nail here. Apply white as base coat. Create some leaves using blue an green. Use a dotting tool to make the two pink oval shapes. Go on to draw the S-shape neck and the backward bending legs in pink. finish off with the eyes and the beak with the black .